A beautiful and poignant love story from acclaimed director Adolfo Alix Jr. and starring festival favorite Coco Martin (The Masseur). 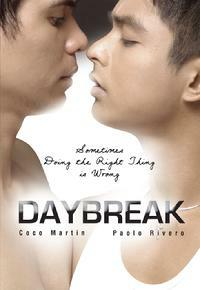 Daybreak happens entirely in one place: a gorgeous modern house in the Filipino countryside and with only two characters. William and JP spend one night contemplating whether to break up or continue their relationship. The men allow us to know their biggest lies and the biggest truths... two people loving each other, clinging to each other, betraying each other- behind the veil of words - they are drawn to each other, but will the dawn of a new day bring this intimacy to an end?